This Persistence Market Research (PMR) report examines the global market for surgical hemostats, internal tissue sealants, and adhesion barriers for the period 2017–2025. The primary objective of the report is to offer updates and information related to market opportunities in the Global Surgical Hemostats, Internal Tissue Sealants and Adhesion Barriers Market. Primary factors fuelling demand for surgical hemostats, internal tissue sealants and adhesion barriers are rapidly ageing population with rising cardiovascular, digestive, orthopaedic and other surgical procedures, strong healthcare consciousness and availability of new surgical adhesives for various surgical application. Other factors driving demand for orthopaedic procedures are rising aging population, new demand for natural surgical surgical hemostats, internal tissue sealants and adhesion barriers with advanced technology, expansion of product in the developing regions with greater efficacy among end users and growing concerns for blood loss during surgical procedures. Availability of multiple surgical hemostats, internal tissue sealants and adhesion barriers and manufacturing of novel products such as new fibrin and collagen or thrombin based sealants with high quality tissue closure strength is expected to bolster growth of the surgical hemostats, internal tissue sealants and adhesion barriers market in the near future. Also, rising adoption of surgical hemostats, internal tissue sealants and adhesion barriers in developing countries, increasing rate of surgical procedures in developed nations with new advanced techniques and product innovation is expected to drive growth of surgical hemostats, internal tissue sealants and adhesion barriers market during the forecast period. The market is currently is witnessing a gradual shift towards advanced biological tissue adhesives from conventional synthetic adhesives used in surgical procedures. This report covers the global surgical hemostats, internal tissue sealants and adhesion barriers market performance in terms of revenue contribution from various segments. This section also includes PMR analysis of key trends, drivers, restraints and opportunities, which are influencing growth of the global surgical hemostats, internal tissue sealants and adhesion barriers market. Impact analysis of key growth drivers and restraints are included in this report to better equip clients with crystal clear decision-making insights. The surgical hemostats, internal tissue sealants and adhesion barriers market report begins with an overview of the surgical hemostats, internal tissue sealants and adhesion barriers and its definitions. This section also underlines factors influencing growth of the surgical hemostats, internal tissue sealants and adhesion barriers market along with detailing of the key trends, drivers, restraints, and opportunities. Impact analysis of key regional growth drivers and restraints based on the weighted average model along with key region-specific trends is included in report to better equip clients with information and hidden insights. At the end of the report, PMR has provided key strategic recommendation for both existing and new players in the market to emerge sustainably profitable. The global surgical hemostats, internal tissue sealants and adhesion barriers market is segmented based on product type into hemostats, internal tissue sealants and adhesion barriers. Based on application, the market has been segmented into surgical repair applications and trauma cases. Based on end user, the market has been segmented into hospitals, specialty clinics and ambulatory surgical centres. A detailed analysis has been provided for every segment and sub-segment in terms of market size, Y-o-Y growth rate, absolute $ opportunity, market attractive index and BPS analysis. In terms of product type, synthetic surgical hemostats, internal tissue sealants and adhesion barriers are expected to remain in dominant position owing to its functional benefits. Synthetic surgical hemostats, internal tissue sealants and adhesion barriers are expected grow at significant rate over the forecast period. The next section of the report highlights the growth trends of the surgical hemostats, internal tissue sealants and adhesion barriers market by regions. It provides a market outlook for 2017–2025 and sets the forecast within the context of the surgical hemostats, internal tissue sealants and adhesion barriers market. The study discusses key regional trends contributing to growth of the surgical hemostats, internal tissue sealants and adhesion barriers market worldwide, as well as analyses the extent to which drivers are influencing this market in each region. Key regions assessed in this report include North America, Latin America, Europe, Asia Pacific and MEA. North America region is expected to emerge dominant and most attractive over the forecast period. The above sections – by product type, by application, by end user and by region – evaluate the present scenario and growth prospects of the surgical hemostats, internal tissue sealants and adhesion barriers market for the period 2017–2025. 2016 has been considered the base year, providing the reference data for projections throughout the forecast period. Detailed company profiles include company-specific long-term and short-term strategies, key offerings and recent developments in the surgical hemostats, internal tissue sealants and adhesion barriers market. Key competitors covered in terms of manufacturers include Pfizer, Sanofi S.A., Cryolife, Baxter International Inc., Braun Melsungen AG, Johnson and Johnson, Cohera Medical, Inc., Tissuemed Ltd., C.R. Bard Inc., Integra LifeSciences Corporation. Increasing geriatric population across the globe coupled with increasing demand for cardiovascular, orthopaedic, digestive, and other surgical procedures is expected to fuel consumption of surgical hemostats, internal tissue sealants and adhesion barriers market. Ageing population, strong healthcare infrastructure, and well-established reimbursements are driving the growth of the global surgical hemostats, internal tissue sealants and adhesion barriers market. Variables, for example, rising number of surgeries, rising rates of sports injuries and spinal issues, and rising need of compelling blood loss administration are central point driving the growth of the surgical hemostats, internal tissue sealants and adhesion barriers market. Likewise, the expanding rate of chronic diseases, bone injuries (hip/knee), expanding obesity rate, expanding trauma/accidental cases and government funding subsidizing for improvement of new surgical adhesives and bio sealants and expanding healthcare expenditure consumption are the central point driving growth during the forecast period. The global surgical hemostats, internal tissue sealants and adhesion barriers market, valuated at US$ 3,158.6 Mn in 2017, is expected to increase at a CAGR of 8.9% through to 2025. The market is predicted to exceed a value of US$ 6,200.0 Mn by the end of 2025. North America holds the largest market share of over 48% in the surgical hemostats, internal tissue sealants and adhesion barriers market and is expected to grow at a CAGR of 9.9% over the forecast period 2017-2025. There are a few customary other options to surgical sealants accessible in the market, which offer comparative outcomes. Surgical adhesive and bio glue will conceivably supplant sutures and staples as they have better conclusion abilities, minimize blood loss, speed up usage, and encourage an easy and less agonizing operation without the requirement for evacuation. Macroeconomic factors such as high unmet patient needs, government reimbursement plans, and strengthening of distribution network by key players in the surgical hemostats, internal tissue sealants and adhesion barriers market is another factor that is going to drive the market in future. Other prominent growth drivers include rapidly growing medical technology industry and cost-effectiveness of the treatment in Asia-Pacific and Latin America regions. The products offer upgraded biocompatibility, quality, and enhanced aesthetics but, some surgical sealants and tissue adhesion products demonstrate less glue quality and have restricted applications. In any case, high cost of surgical sealants, outlining quality, and stringent administrative approvals, less access of new adhesive technology in developing regions are posturing noteworthy difficulties to market growth of surgical hemostats, internal tissue sealants and adhesion barriers during the forecast period. However, economic issues in some countries and reimbursement cutbacks, the high expenses of surgical procedures and stringent administrative approvals are posturing huge difficulties to market development are some central point that could hamper the growth of the surgical hemostats, internal tissue sealants and adhesion barriers market to a specific extent during the forecast period. 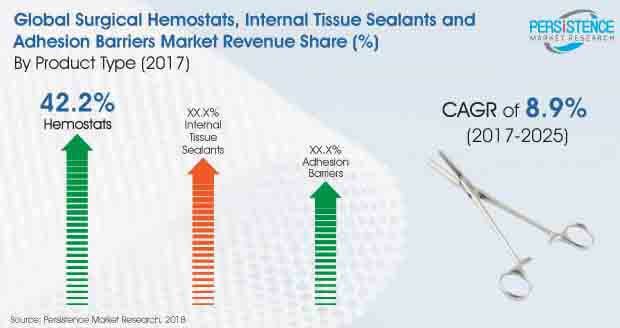 Among these, hemostats product type segment is expected to exhibit the highest growth over the forecast period with a CAGR of 8.9%. Based on application, the market has been segmented into surgical repair applications and trauma cases. Surgical repair currently accounts for the highest revenue share in the market. Also, trauma cases in the applications segment is going to grow exponentially at significant CAGR of 8.5% during the forecast period. Based on end users, the market has been segmented into hospitals, specialty clinics, and ambulatory surgical canters. Hospitals currently account for the highest revenue share in the market followed by specialty clinics and ambulatory surgical centers. Hospitals end user segment is going to grow exponentially at significant CAGR of 9.4% during the forecast period. In terms of value, North America is the largest market, and is expected to increase at over 9.9% CAGR during the forecast period. Growth of Asia Pacific market is also expected to be grow by 8.8% due to rise in medical tourism for surgical procedures and number of well-developed healthcare infrastructure and specialty clinics. Some key players in the global surgical hemostats, internal tissue sealants and adhesion barriers market identified are Pfizer, Sanofi S.A., Cryolife, Baxter International Inc., Braun Melsungen AG, Johnson and Johnson, Cohera Medical, Inc., Tissuemed Ltd., C.R. Bard Inc., Integra LifeSciences Corporation. The report also identifies company-specific strategies related to product development, market consolidation initiatives and analysis of their specific strengths, weaknesses, opportunities and threats.